Quickly determine the perimeter and area of multiple geometric shapes. Is there a better alternative to Geometry Calculator? Is Geometry Calculator really the best app in Mathematics category? Will Geometry Calculator work good on macOS 10.13.4? 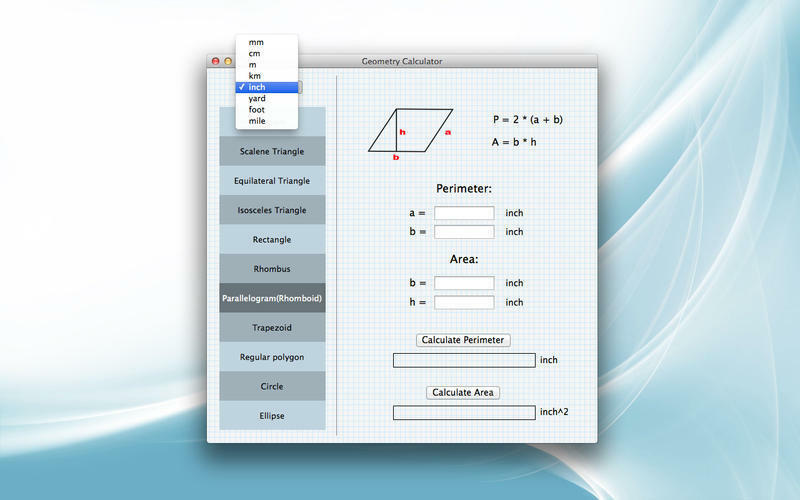 Geometry Calculator enables you to quickly determine the perimeter and area of multiple geometric shapes. Our calculator provides a professional look while delivering accurate results. Geometry Calculator needs a review. Be the first to review this app and get the discussion started! Geometry Calculator needs a rating. Be the first to rate this app and get the discussion started!